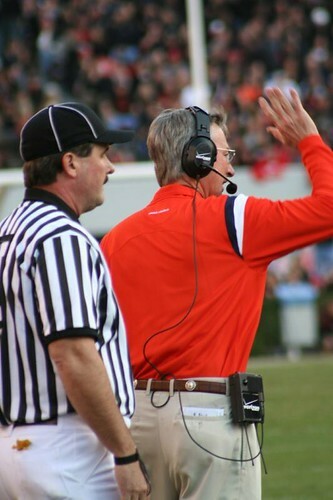 Athens, GA (Oct 8, 2008) - Tommy Tuberville must be under some enormous pressure to fire offensive coordinator Tony Franklin 6 games into the 2008 season, with a 4-2 record. One has to wonder if Tuberville was never really comfortable with the spread offense, he should not have hired Franklin in the first place. Firing Franklin 6 games into his first year on the job has got to be a record for a team with a winning record. But then again, after a 3-2 win over Mississippi State and a 14-13 loss to Vanderbilt last week, something obviously was not working. Interestingly, there is no mention of the firing on the Auburn University football web site yet, but the news is everyplace else, and is topping Google searches right now. The next few days will be very interesting to see what kind of second-guessing will come from the media. Can Auburn defeat 2-3 Arkansas, a team that has been outscored 139-31 in their last 3 outings, and have won their two games by a combined total of 4 points? The future does not look very bright for Tuberville (pictured left). Photograph Copyright 2007 by Eye on Sports Media/The Cayuga Group. LLC. All Rights Reserved.